Emma Wood State Beach is at the south-east start of the stretch of Southern California coast known locally as The Rincon. It makes the most of an open area underneath an overpass, and an otherwise difficult-to-access stretch of shoreline, just west of Ventura. 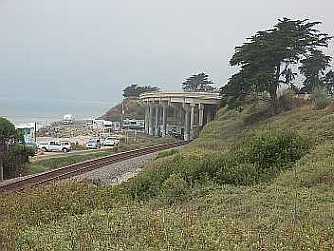 The campground stretches out along the coast, southeast from the entrance. This site is for RV and other fully self-contained vehicles only, no tent camping is allowed. Technically it’s considered "primitive" camping: no water, restrooms, electricity; no phones, no fire rings and no dump station. If you want fancier digs, Emma Wood Group Camp and Ventura Beach RV Resort are both just two miles to the southeast. So if it's that primitive, what DOES it have? The beach at your feet. In fact, this campground is so close to the surf that during exceptionally high tides and severe winter storms it gets closed entirely. Surf fishermen LOVE it here. 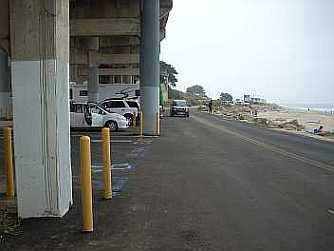 A friend of mine often parks just south of the state beach, just along the road, walks across the campground to the beach for an afternoon of catching fish. Here's a photo of that area; it's also in the movie at the top of this page. The sites here aren't all level, so expect to put your best RV leveling talents to the test. Sites are a mixture of asphalt, dirt, cobble and beach debris. Leashed dogs are welcome in the campground, but not allowed on the beach. Park rangers lock the entrance gate promptly at 10 p.m. and open it at 6 a.m. 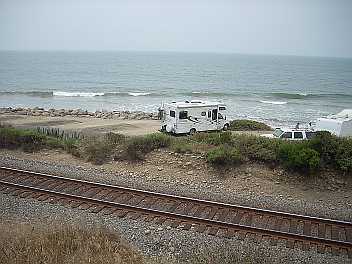 The nearest state beach with an RV water and waste dump is to the south at McGrath State Beach, 15 miles away, although other local county and private RV campgrounds have dump stations for their paying visitors. Maximum vehicle length is 40 feet due to short turn-around areas, which you can easily see in the image above. Emma Wood State Beach lies two miles north of the city of Ventura. If you're driving the 101, get off at the State Beaches Exit and follow the offramp to the frontage road. The Emma Wood entrance will be right ahead. Fees are $20 per night and $8 per each extra vehicle. Call ahead for reservations, and be sure to note that from Oct. 1 through March 31 the park is only open Fridays through Saturdays. For more information, check out the California State Parks Web site or call (805) 968-1033. Come back soon! We'll be adding more details about Ventura beaches. Photos and movie copyright www.west-coast-beach-vacations.com.